For a sport with such ancient roots, badminton has a relatively short Olympic history. It was introduced to the Games as a demonstration sport in 1972 at Munich and made its debut as a full medal sport in 1992 at Barcelona. Badminton holds the distinction of being the world's fastest racket sport. China's Fu Haifeng had a smash recorded at a speed of 206 miles per hour at the 2005 Sudirman Cup, so lightning-fast reflexes, speed and agility are essential attributes for the leading players. So too is stamina, as players have been known to cover more than six kilometres in a single match. There are five events in Olympic badminton: men's singles and doubles, women's singles and doubles, and mixed doubles. In each, the top eight players or pairs are seeded and medals are decided by an elimination tournament. 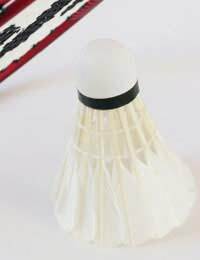 Players volley a missile of cork and goose feathers across a net 1.55metres high into a court 13.4m long and 6.1m wide. It is played indoors, but a ceiling height of 12m is needed. A match is the best of three games and. The Badminton World Federation, formerly the International Badminton Federation, made changes to the scoring system ahead of the Games in Beijing. Points can now be scored against the serve, and in doubles a team has only one serve instead of two. The first player or pair to 21 points wins the game, although if the score reaches 20-20 a two-point advantage is needed. At 29-29, the first to 30 points wins. China, Indonesia and Korea have dominated the sport since its Olympic introduction, sharing all but one of the 19 titles up for grabs between 1992 and 2004. Indonesia won both the men's and women's singles titles in Barcelona, but China won eight of the 15 gold medals on offer at the next three Games. This is perhaps fitting as, although the sport in its modern form was founded in England, its earliest predecessors can be traced back to China. As early as the 5th century BC, the Chinese were playing a game with their feet called Ti Jian Zi, or shuttle-kicking. The shuttlecock was involved, but it is unclear whether or not Ti Jian Zi led to the game of battledore and shuttlecock that arose about five centuries later in China, Japan, India and Greece. It had developed into a popular children's game by the 17th century, with the battledore (a kind of paddle) used to keep a shuttlecock (a small feathered cork) in the air as long as possible. Quickly it became a favourite pastime of the upper classes in many European countries and was known as 'jeu de volant' on the continent. Poona, a game closer to modern badminton, had evolved in India by the mid-19th century. British army officers stationed there added a net set down rules in 1867, and six years later the Duke of Beaufort introduced it to royal society at his country estate, Badminton House in Gloucestershire. In 1877, the first written rules were laid out by the Bath Badminton Club and 16 years later the Badminton Federation of England was formed. It held the first All England Championships in 1899.